Who should be educated, when, by whom and how? What purposes should education serve? Why does education matter? These fundamental questions of value are not always seen as central to the sociology of education. However, this book argues that they are pivotal and provides a sophisticated and engaging introduction to the field that is designed to open up these important debates. It draws attention to the many points of disagreement that exist between major thinkers in the sociology of education, and the values on which their ideas are based. By involving readers in crucial questions about the potential contribution of sociology to education policies and practices, it aims to bridge the divide between education as it is talked about by academics, and the concerns of policymakers and educators who have to make practical decisions about what is to be done. Chapter by chapter the book introduces competing approaches in the sociology of education - structural functionalism, symbolic interactionism, Marxism, feminism, critical race theory and poststructuralism. It shows how these can be applied to major themes such as social reproduction, the politics of knowledge, multicultural education, identity and teachers’ work. Throughout, the authors emphasise the importance of understanding social and educational values and the ways in which these underpin and impact upon the work of both academics and educators. "The authors are to be commended for their densely nuanced exploration of complex debates about values, reflexivity and ethics in sociological knowledge and for their use of local, national, global and interdisciplinary examples of educational practices, processes and instances." "Provides a thorough, cohesive and incisive account of the ways in which a value based approch to education has much to offer. The clarity of the arguments make it a good text to use with students whilst also providing an engaging resource for those who have a background in education but may not have considered their field in this light." "This book is about how the sociology of education works as an intellectual practice. It offers new and important insights into the complex and often troubled relations between sociology and education." 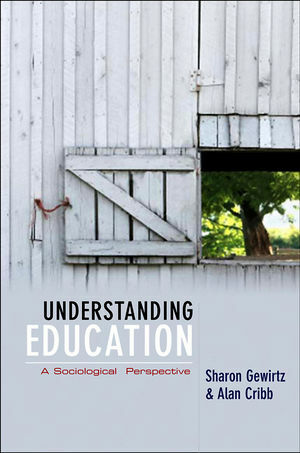 "With extraordinary clarity, Gewirtz and Cribb map the complexity of theories and perspectives in the sociology of education and interweave a discussion of the centrality of its political and ethical dimensions. They build a compelling, nuanced – and much needed – case for a rigorous politically committed educational sociology." "This important book charts the field of sociology of education, with innovative attention to the issue of values within this body of work. The analysis both celebrates and interrogates the normative dimension of sociologists' work in education, and in doing so provides a lively engagement with the field that will stimulate students and experts alike." Fills a gap in the sociology of education market for an accessible and thought-provoking theoretical text for upper-level undergraduates. Combines a comprehensive and rigorous overview of various thinkers, theories and concepts in the sociology of education, with a clear and accessible style. Explores the values that underpin various theories of education in order to ask, and help answer, questions such as who should be educated, how and when should they be educated and what should they be taught. Covers sociologists’, teachers’ and policymakers’ experiences and understandings of education.